If you are deciding which type of bat to get, then the following should be informative. The differences between a Composite, Aluminum, Hybrid and Wood bat may be obscure, but the following makes it simpler. We compare each type of bat to the other three. Below, we also have some general recommendations for collegiate, high school and little league players. When we speak of composite bats we mean bats that have a composite barrel. Some bats have a composite handle and an aluminum barrel but those bats are called “Hybrids,” not composites. Composite barreled bats can be a single piece of material (called a single piece composite) or a two piece bat where both the handle and barrel are made of a composite material and mended together through some connective process. Composite, generally speaking, is a refined plastic made of carbon materials. These “carbon fibers,” as they are often referred, can be shaped to give a bat a number of useful properties like weight, strength and pop. it is fair, although uncommon, to refer to composite bats as plastic bats. Composite barreled bats almost always cost more than the rest. Composite bats (like wood) will crack upon breaking. Aluminum bats dent. Composite bats tend to have better durability than wood. But, not as durable long as aluminum. Composite barreled bats can be single piece or two piece bats. Composite bats can, and generally do, have a lower swing weight than aluminum or wood. Composite bats can, and usually do, have a larger barrel than other types of barrels. Composite bats usually require a break in period of several hundred hits. Over time, composite bats can increase in trampoline effect. Hence the need to work them in. Single piece aluminum bats are exactly as they sound: a bat shaped from a single piece of aluminum. Manufacturers are prone to put different elements, in small amounts, within the aluminum to give it enhanced properties like durability. These additives in the aluminum are why we refer to the aluminum as ‘aluminum alloys’. Aluminum bats are almost always less expensive than others types of bats. Manufactures add elements in their aluminum blend to create an aluminum alloy. All alloys and their additives are not created equal. Hence the price differences between aluminum bats. Alloy bats are generally heavier to swing than composite. Single piece alloy bats tend to feel more stiff, similar to wood, through contact. Alloy bats tend to have a smaller barrel than composite. Alloy bats break by denting, not by cracking. Small dents can be found by rubbing your hand and fingers over the bats feeling for inconsistencies. Most manufacturers suggest using aluminum bats in cold weather. See that lengthy reasoning here. In terms of what Major League Baseball allows, only Birch, Ash and Maple bats are allowed at the plate. It is said those woods can have the correct grain structure and hardness as to not create dangerous situations. Birch and Maple bats require an ink dot test to measure the straightness of the grain and, without that test, are not legal for play. Wood bats are usually less expensive per bat. Yet, over a season, more wood bats are required because they break more often. A wood bat’s sweet spot, although usually quite smaller than composite or alloy, may perform as well as a .50 BBCOR certified bat. Wood bats are heavier, and therefore harder, to swing compared to aluminum and composite. Wood bat drops are rarely larger than a 6. Most are within a 2 or 3. Wood bat ends are cupped to decrease the swing weight. Some youth wood bats have massive holes bored. Wood bats must be hit on the face grain for maximum performance or risk breaking. This is usually done making sure the label of the bat is up at contact. There are way more wood bat companies than anyone usually imagines. One major difference between wood bats of the same tree type is if the wood billet was sawed or split. In theory, split wood tends to be stronger as wood splits along its strongest grains. Bats are considered hybrid if they have a composite handle and an aluminum alloy barrel. The general intent is to take the benefits of the light swinging composite bat and combine that with the durability of an aluminum alloy barrel to make one superior bat. Many agree and prefer hybrid bats over any other. Hybrid bats are made of both composite and aluminum material. Hybrid bats tend to cost less than a composite bat and more than a single piece aluminum alloy bat. (There will always be exceptions to this). The most traditional hybrid bat is a composite handle and aluminum (or alloy) barrel. One idea behind traditional hybrid bats it the improved feel at contact achieved. This occurs because the connective piece between the composite handle and aluminum barrel absorbs the vibration. There are now several variations of the Hybrid bat on the market. They include hybrid bats with an alloy barrel and composite end caps or a composite shell on an aluminum bat or soft composite outer shell and a hard aluminum inner barrel. Like Aluminum, Hybrid bats are hot out of the wrapper and tend to be more durable when compared to composite barrel bats. If we were to make an argument to prefer composite bats we’d put forth two arguments both of which stem from the reality that composite material allow for a larger range of engineering feats in the bat realm. These feats allow engineers to (1) create greater plate coverage with optimal swing weights. The expanded capabilities of composite also allows major manufactures the chance to be as (2) creative and push the envelope of innovation. This point may may be valid but we’ve found it only marginally true and arguably helpful. The best aluminum bat doesn’t give up very much in plate coverage when compared to the best composite per swing weight. However, baseball is sometimes a game of millimeters and an additional 1/16 of an inch on the inside barrel of a bat may very well the difference you are looking for. In the little league bat space composite bats do possess the ability to have greater pop (or trampoline effect) than their aluminum counterparts. As the graphite fibers inside the bat get messaged in the composite bat gains more trampoline effect. However, leagues now regulate the amount of trampoline effect a bat can work into through an accelerated break in test (ABI). Aluminum bats, on the other hand, are never hotter than when they are taken out of the wrapper. There is no break in period required. Aluminum bats, in theory, begin to lose pop over time as imperfections in the aluminum, caused by hitting baseballs, negatively effect the pop in the bat. While the properties of aluminum make it so the bats rarely break, they do indeed lose their pop in time. Better aluminum tends to imperfect less easily. While composite bats may have a larger barrel (and sweet spot) our experience finds most collegiate players prefer a top end aluminum barreled baseball bat. Very generally, many of them prefer the hybrid versions of top end bats because they are (1) hot out of the wrapper so they require no break in period and (2) tend to be more end loaded. Others often prefer high one piece aluminum bats for generally the same reason but with a stiffer feel through contact (much like wood). For High School, BBCOR requirements mandate both composite and aluminum perform the same as wood bats. You may have a good reason to purchase a composite bat that is BBCOR certified (like it has a bigger sweet spot) but it isn’t because composite BBCOR bats have more pop than their less expensive counterparts. 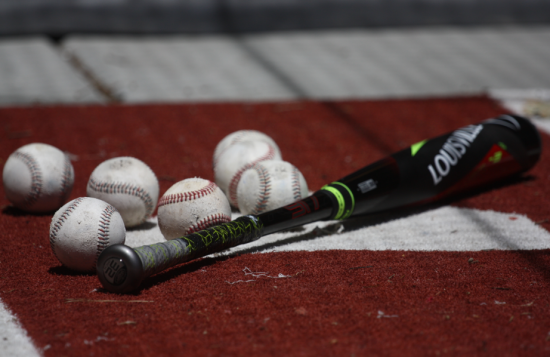 Despite their similar performance standards, we suggest, very generally, that the majority of high school players will prefer a composite BBCOR bat for its (1) larger barrel size and (2) generally lighter swing weight. The added sting dampening that generally comes with composite bats is an added bonus. Unfortunately, these bats also tend to cost the most. In the event a player does have the real strength to hit very well consistently then we wouldn’t be opposed to a performance level hybrid bat. Little league recommendations are often more a function of budget then performance. Assuming an unlimited budget we’d generally recommend a performance composite baseball bat for its (1) sting dampening, (2) large barrel size and (3) lighter swing weight. Of course those are simply general suggestions and there will always be exceptions. However, it should be noted, we would not purchase a cheap bat just because it was composite over a higher performance hybrid or single piece alloy bat. We’ suggest purchasing a composite bat for a little-leaguer dependent upon the number of games played. Over 45 in a given year and it might be the right bet. Between 20 and 45 games a year we’d suggest a hybrid. Less than 20 it doesn’t make much sense to spend a lot of money on a bat therefore go aluminum. There is, roughly, no example we can think of where a wood bat is the right answer for a little leaguer.